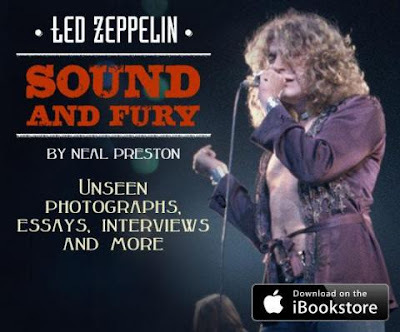 Led Zeppelin are releasing a digital book, Led Zeppelin: Sound and Fury, exclusively through the Apple iBookstore on April 15th. Neal Preston, a photographer with up-close access to the group during the 70s, wrote the book. According to a presser, the book "blend[s] images, interviews, and information to allow readers inside access into some of the greatest moments in rock history." The digi book features a host of content including 250 of photos of the band onstage and behind the scenes (including over 100 previously unseen images), audio introductions, written pieces, hi-definition video interviews, commentary from contemporary artists, technical camera info, a band discography and more. Led Zeppelin: Sound and Fury features an introduction written by Stevie Nicks; it is available for pre-order at the iTunes store now. Re: Fleetwood Mac EP "awaiting artwork approval"